The new 2019 Armada is arriving at dealerships and is just like the sold-out 2018 Armada, featuring NissanConnect Services by SiriusXM, an eight-inch multi-touch display, HD Radio, enhanced voice recognition, hands-free text messaging, more USB ports, and an available electronic rearview mirror. It borrows heavily from the pricier INFINITI QX80, offering a posher experience compared to most vehicles in the segment. Unfortunately, it's not always easy to find in stock. Nissan offers are regional and are set to expire April 30, 2019. Our examples are based on a Los Angeles location. Nissan is offering a $3,500 cash-back rebate, plus dealers have $1,000 to play with on price, though you’ll have to negotiate to get those savings. Neither of these discounts can be combined with the promotional finance rates listed below. There’s also a $1,000 finance bonus available, which is compatible with the offers above, for a total of up to $4,500 off when financing at non-promotional rates. Promotional rates start at 0% APR for 60 months, 1.9% APR for 72 months, or 2.9% APR for 84 months. In addition, there’s a $1,000 finance bonus for financing at promotional or non-promotional rates. Leasing a 2019 Armada 4x2 SV starts at $349 per month for 24 months with $3,829 due at signing (previously $399 per month for 24 months with $4,699 due at signing). This includes an allowance of 12,000 miles per year, and with an effective monthly cost of $509, it is an excellent value. Now standard for 2019 are four driver-assist features: rear door alert, adaptive cruise control, automatic emergency braking, and intelligent forward collision warning. The Armada offers one powertrain choice: a 5.6-liter V8 engine that generates 390 horsepower and 394 pound-feet of torque. It works with a seven-speed automatic transmission to send power to the wheels. All models come with standard rear-wheel drive, while four-wheel drive is $3,000 extra across the lineup. This setup achieves an EPA-estimated 14 miles per gallon city, 19 mpg highway, and 16 combined, or 13/18/15 mpg (city/highway/combined) with 4WD. 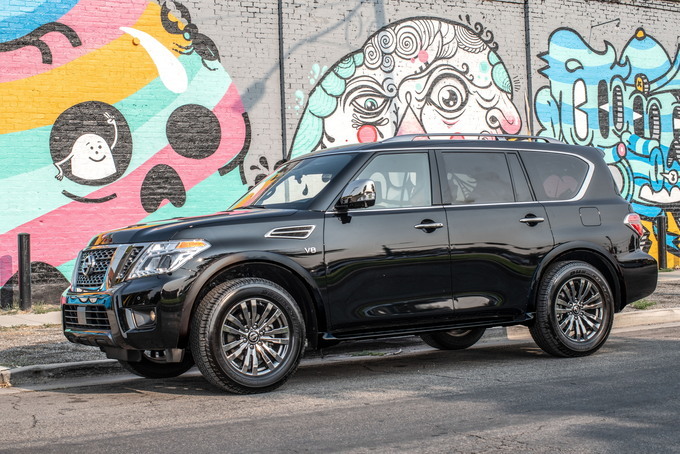 When properly equipped, the 2019 Armada pulls up to 8,500 pounds, which compares favorably to the GMC Yukon and Toyota Sequoia. Nissan prices the Armada SV, which seats eight, from $48,395 (all prices include the $1,295 destination charge). Standard exterior features include automatic halogen headlights, LED daytime running lights, roof rails, and 18-inch aluminum wheels. Other features include cloth seats, a tilt-and-telescopic steering column, full power accessories, dual-zone climate control, a 13-speaker Bose audio system, and navigation. Options include Pearl White paint ($395) and a Driver Package ($600) that adds fog lights, HomeLink, a power liftgate, a power 60/40-split third-row seat, a tow hitch receiver, an automatic dimming rearview mirror, and a tow hitch receiver with wiring. The Armada SL costs $53,195. It comes with remote engine start, fog lights, a power liftgate, and 20-inch aluminum alloy wheels. Inside, this model has leather seats, a power driver’s seat, a surround-view monitor, an automatic dimming rearview mirror, and a power tilt-and-telescopic steering column. The Captain's Chairs Package ($450) knocks seating capacity down to seven by adding second-row captain's chairs that fold down and tip up for easy entry to the third row, and a padded and wood-trimmed center console. The Premium Package ($1,480) adds intelligent distance control, blind-spot monitoring, backup intervention, and a power moonroof. Nissan prices the Platinum from $61,395. This model features tinted clear-coat wheels, a power sliding moonroof, and a family entertainment system with dual seven-inch displays. Nissan also adds front wiper de-icer, leather door trim, a surround-view monitor, blind-spot monitoring, backup intervention, and lane departure warning. The lone option package is the Captain’s Chairs Package. The top-trim Platinum Reserve is priced from $64,395. This trim includes 20-inch dark chrome-clad aluminum-alloy wheels, a dark chrome grille and door handles, two-tone leather-timed seats with contrast stitching, wood-tone and Black Quartz trim, and special badging. This model offers standard seven-passenger seating as the Captain’s Chair Package is included. 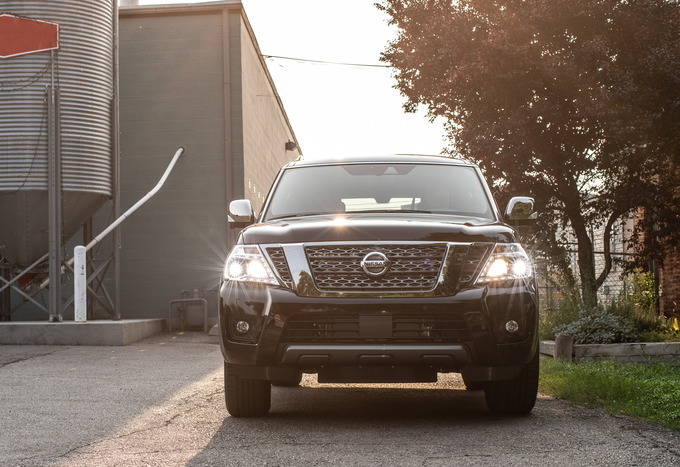 The 2019 Nissan Armada SV comes well equipped and the available Driver Package adds value for a low cost. For just over $50,000, you can get a four-wheel-drive model that costs less than the Ford Expedition and Chevrolet Tahoe. 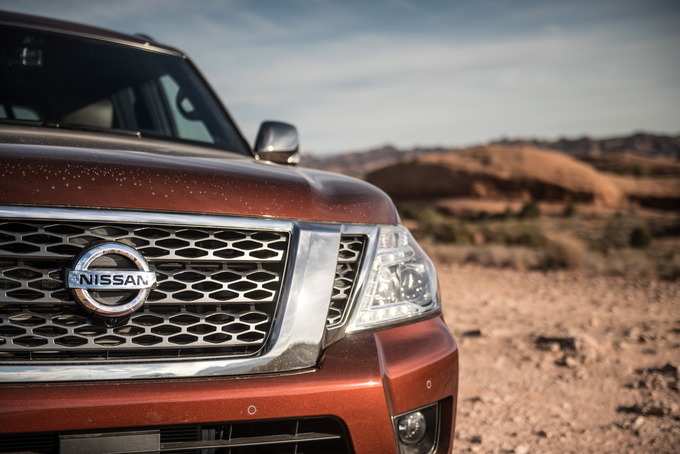 The 2019 Nissan Armada is the automaker’s largest and most rugged SUV. 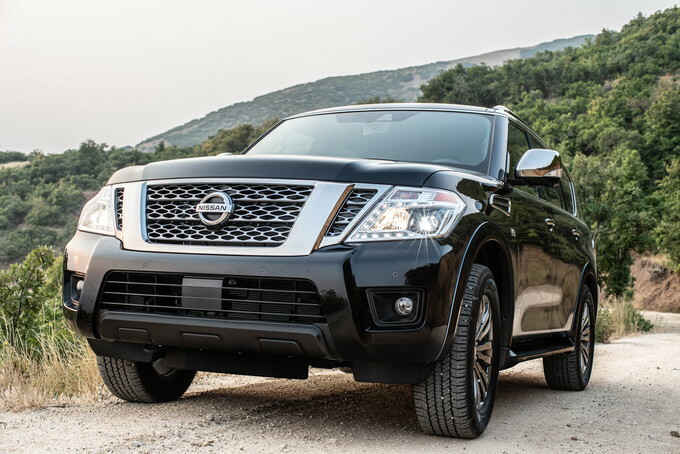 Continuing on as an old-school, body-on-frame SUV with a massive V8 engine, the Armada is a larger-than-life hauler that's tough enough to handle going off-roading, towing large cargo, and ferrying people around. Obviously, fuel economy is a major drawback thanks to the Armada’s gargantuan size and eight-cylinder engine. Sharing a lot of the same components as the upscale INFINITI QX80, it’s best to keep things simple with the Armada. With roughly $19,000 separating the base Armada to a fully-loaded model, getting into a higher trim encroaches onto the Infinti QX80’s territory, which is more of a luxury vehicle. With that in mind, we recommend going with the SL trim, as it comes with a decent amount of standard features. The Armada SL comes with 20-inch wheels, automatic headlights, LED running lights, fog lights, heated exterior mirrors, front and rear parking sensors, rain-sensing wipers, and a power liftgate on the outside. Interior features include an right-inch touchscreen, navigation, dual-zone automatic climate control, an auto-dimming rearview mirror, a power tilt-and-telescopic steering wheel, a 10-way power driver’s seat, heated front seats, leather upholstery, and a 13-speaker Bose audio system. Tipping the scales at roughly 6,000 pounds, the Armada is practically begging for a V8, and the 5.6-liter behemoth found in the SUV does a fine job of moving the vehicle. The engine is rated to make 390 horsepower and 394 pound-feet of torque, and is paired to a seven-speed automatic transmission. With the heavy-duty pairing, towing capacity for the Armada is rated at up to 8,500 pounds. 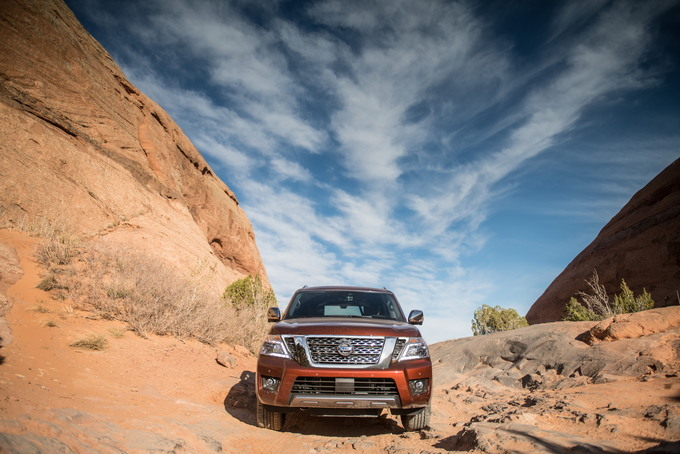 While the Armada excels at handling heavy-duty tasks, and even some minor off-roading thanks to its Nissan Patrol-based underpinnings, the massive SUV fails to inspire when it comes to handling anything that resembles a corner. With its massive body, tall design, and weight, piloting the Armada isn't an enjoyable experience in everyday situations. Another drawback with the Armada is its fuel economy ratings. The Armada achieves an EPA-estimated 14 miles per gallon city, 19 mpg highway, and 16 combined with two-wheel drive. Go with four-wheel drive, and those figures are even worse at 13/18/15 mpg (city/highway/combined). The Armada sticks to its original roots with a boxy, unapologetic design that highlights its full-size stature. While being a box on wheels may sound like a bad thing, Nissan has inserted enough curves and design elements to brake up the monotony. High fenders and a front bumper that protrudes ever so slightly stand out at the front. At the back, the rear taillights are oddly small for a SUV of its size, while the rear bumper adds even more length to the vehicle. Because of the Armada's large size, the SUV has an incredible amount of interior space. Regardless of whether you go with an eight-seat layout or a seven-passenger design, the Armada has plenty of space for everyone. That space also translates to cargo capacity where the SUV has a total of 95.4 cubic feet of cargo space. In addition to having a cavernous cabin, material quality is upscale, and sound is kept to near luxury standards. The redesign that occurred back in 2017 brought tons of value to low-end Armadas, especially considering other full-size competitors. Interior materials and the serene cabin also help the Armada stand out of a segment that continues to expand. Even for a vehicle of this size, fuel economy isn't very good. Being able to hide a massive SUV's weight takes some magic, and it's a trick that the Armada hasn't learned yet. People looking for a spacious vehicle that can two a boat with ease. The Armada will impress if you're after having a quiet and comfortable family hauler that excels on the highway, too. If you want something that's easy to park, somewhat decent on gas, or comes with the latest features, you might have to look elsewhere. No full-size SUV excels at taking corners enthusiastically, but the Armada really likes straight, open roads. So, if you live near a windy road, you might want to find a new route home, or a different vehicle option. 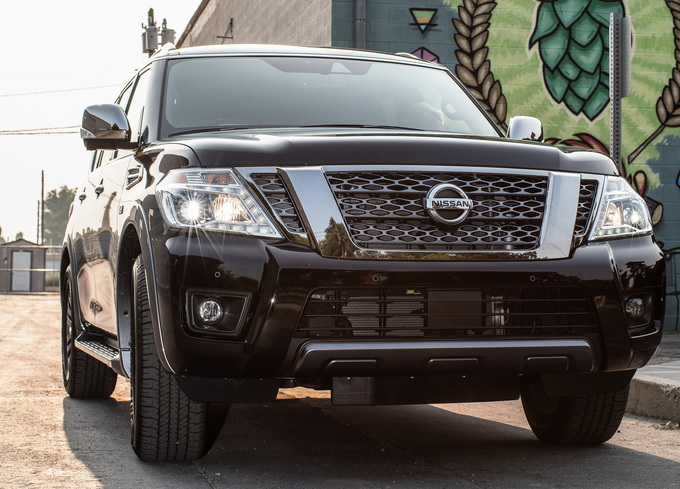 First and foremost, the 2019 Nissan Armada, if you stick to one of the lower trims, represents good value. You get a heavy-duty SUV that can seat eight in comfort, handle rough terrain, and tow loads of cargo. Look past the abysmal fuel economy, and you're left with a SUV with unique styling, a quiet and spacious cabin, and a capable V8.